If your family is a pirate loving crew then the Walt Disney World Resort may be just the place for a summer break. With multiple attractions spread across the property you can be living an imaginative pirate's life whether your favorite is Captain Jack or Captain Hook. We've scoured the land and come up with tips to guide you to the treasures. Dead men tell no tales, so a would be pirate needs rest before setting sail on an adventure. 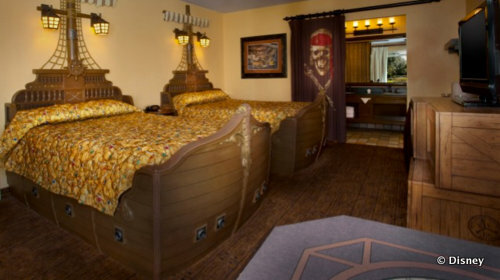 Your buccaneers will feel right at home when they check into a pirate themed room at Disney's Caribbean Beach Resort! These rooms feature ship shaped beds and a little hidden treasure. If you really want to take the room decor up a notch, for an additional cost Disney's Enchanted Florist would be happy to deliver a pirate themed in-room celebration. A note from Captain Jack can send you on a quest to follow riddles that lead your family to a treasure he's hidden from Blackbeard! The whole crew can start their day out at the Magic Kingdom with a visit to the Pirates League in Adventureland, where theme park guests turn into savvy swashbucklers with a pirate make over! Guests who want to join Captain Jack's motley crew will receive a pirate identity and transform into a pirate by a sea-sailing Master before gaining access to a secret treasure room. "Multi-Eyed Jack" Note that his eyes are actually closed in the picture. The next stop on this swashbuckling adventure is to take in some lessons at Captain Jack's Pirate Tutorial, where you can discover the not-so-gentle art of being a pirate in this high-spirited school of skullduggery and sword fighting! Shows run several times throughout the day so be sure to check your entertainment guide to pick the best viewing for your crew! Now that you're dressed like a pirate and have gotten some pirate lessons, you're ready to hop on the attraction that started it all, Pirates of the Caribbean. Join this boisterous group of really bad eggs and spend a 9-minute cruise plunderin' the town and singin' their song. 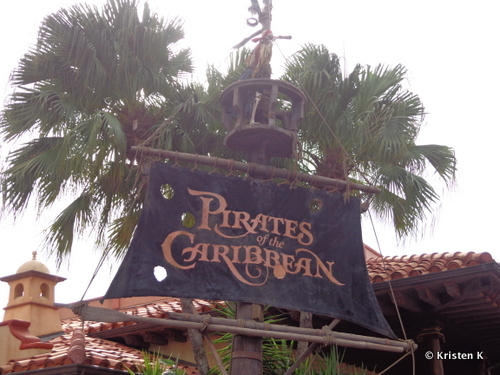 Pirates of the Caribbean is widely considered to be one of the most spectacular attractions ever created for a theme park and the inspiration to the popular Pirates of the Caribbean movies. And just launched at the Magic Kingdom, the stakes on the sea roving fun get raised even higher with the debut of a brand new interactive in-park treasure hunt! A Pirate's Adventure: Treasures of the Seven Seas is a questing game with different five pirate raids that sends swabbies scurrying through Adventureland and battling bad guys to save us all. Would you believe that these are just a handful of the fun pirate happenings at Walt Disney World? Over at Disney's Hollywood Studios you'll find more adventure with the brand new high tech adventure, The Legend of Captain Jack Sparrow, and at Disney Quest you can find even more adventure with the interactive game Pirates of the Caribbean: Battle for Buccaneer Gold. Oh... and that's just the Pirates in the Caribbean fun, because while you're at Walt Disney World you'll also be able to find Captain Hook, Mr. Smee, Jake and the Neverland Pirate Crew in rides, shows, parades and even a night time fireworks voyage on the Seven Seas Lagoon. Disney World is a treasure trove of swashbuckling entertainment that is sure to delight pirate fans of all ages. Are you ready to live a pirate's life at Walt Disney World? Leave a comment below and let me know which is your favorite of these pirate goods! Well, aside from my pirate Mickey ears and all my pirate pins, I say PotC the ride!! So much fun. 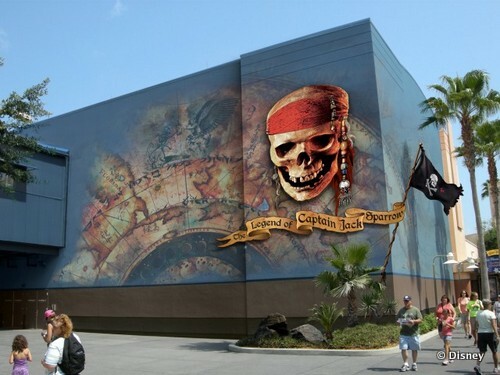 I'm looking forward to checking out the Pirate Adventure at MK and the Legend of Jack Sparrow at HS in September. With "The Legend" be prepared for a LOT of standing. First the queue, then you stand through the show. There is no accommodation for those with a GAC, you have to wait in the same queue with everybody else. Now they will have ECVs & wheelchairs go through the doors first, but you get put in not the best viewing area. So I saw it once, don't need to go again.